Do you often wonder what is the life of residents in the Kwun Lung Lau? Now, you have the chance to have a glimpse by joining the Lap-Chee Neighbourhood Outreach Project. The service learning project provides an opportunity for students to learn about the life of homebound elderly and the limitations of the healthcare system in Hong Kong. Student helpers will be working with some housewives to bring out home visits to the homebound elders in Kwun Lung Lau. 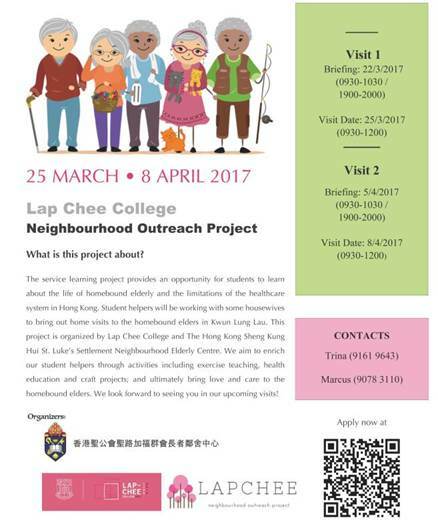 This project is organized by Lap-Chee College and The Hong Kong Sheng Kung Hui St. Luke’s Settlement Neighbourhood Elderly Centre. We aim to enrich our student helpers through activities including exercise teaching, health education and craft projects; and ultimately bring love and care to the homebound elders. We look forward to seeing you in our upcoming visits!